Looking for a unique and stylish way to display special bottles of wine? 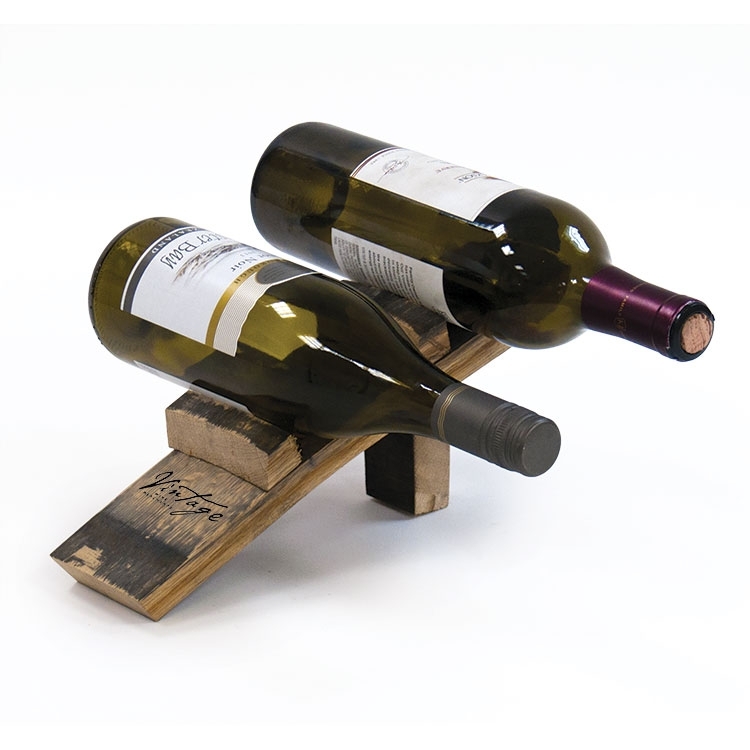 This Stave Bottle Holder is constructed of recycled staves from real wine barrels! 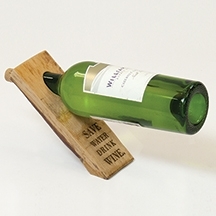 Ideal for use as a merchandise display, or simply in the home. Due to variations in wood grain and stave sizes, every unit will be unique! The underside of each stave is stained from the wine it used to contain. Customize your unit with imprinting or laser engraving - Call today for details! Highlights liquor on bar backs and retail displays, highly polished black acrylic construction. Also available in sizes for two or three 750ml bottles. Crisp, high definition imprinting available. Custom glorifiers available - call today! 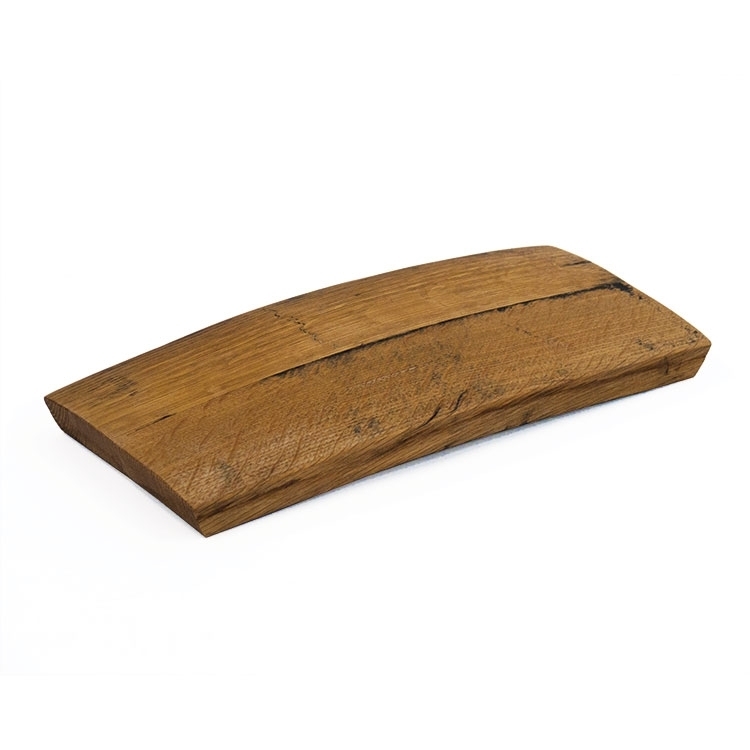 This stylish cutting board is constructed of two recycled barrel staves. 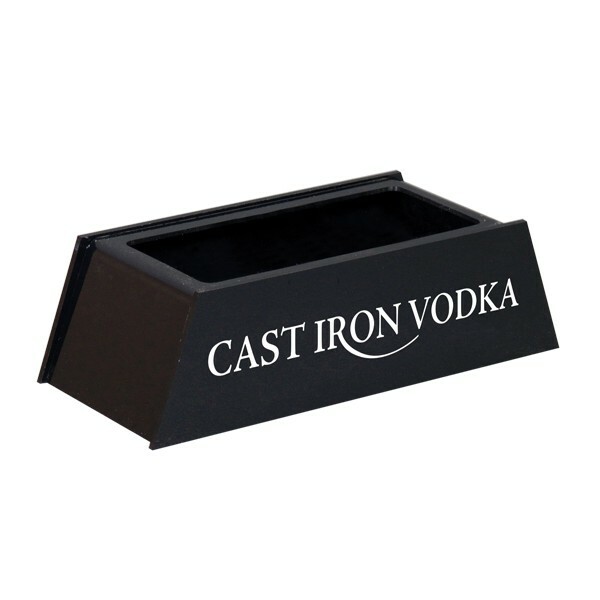 Ideal for use at promos, demonstrations, trade shows, or as a merchandise riser in any retail setting. Due to variations in wood grain and stave sizes, every unit will be unique! Customize your unit with laser engraving - Call today for details! Digital imprinting is also available, but please note adding ink to this unit will make it no longer food safe. This pedestal/bottle glorifier will sure to draw attention to any product you choose to display. This 12" x 12" x 6" display is fully illuminated on four sides. Available in a variety of finishes and lit sides can easily be imprinted with your graphic. This is a plug in item - NOT battery powered. Custom glorifiers available - call today! 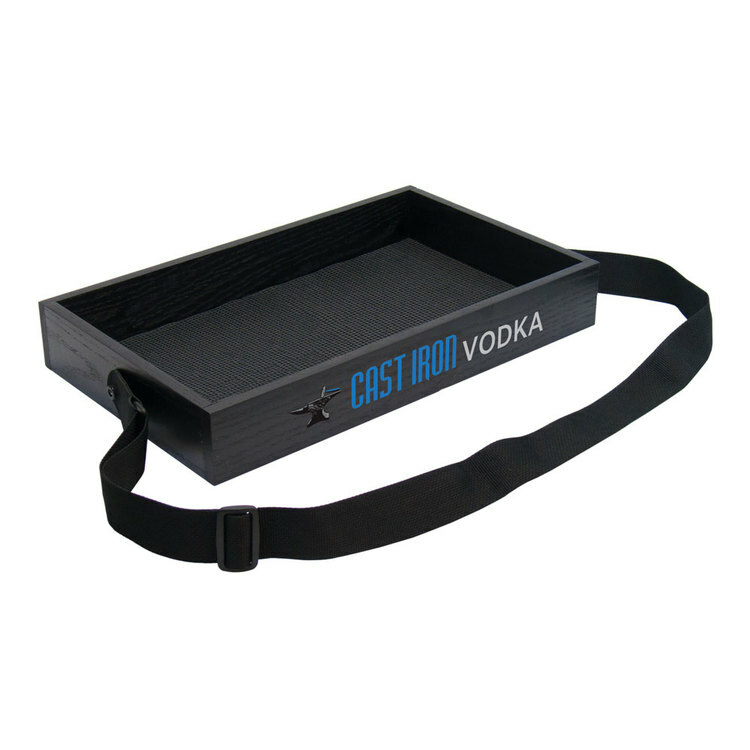 This serving tray creates a sleek and unique way to present product to your customer. The convenient strap provides ease of use for servers to walk around retail spaces, restaurants, bars, or even promotional parties! Available in your choice of our standard stains! Customize further with an imprint! 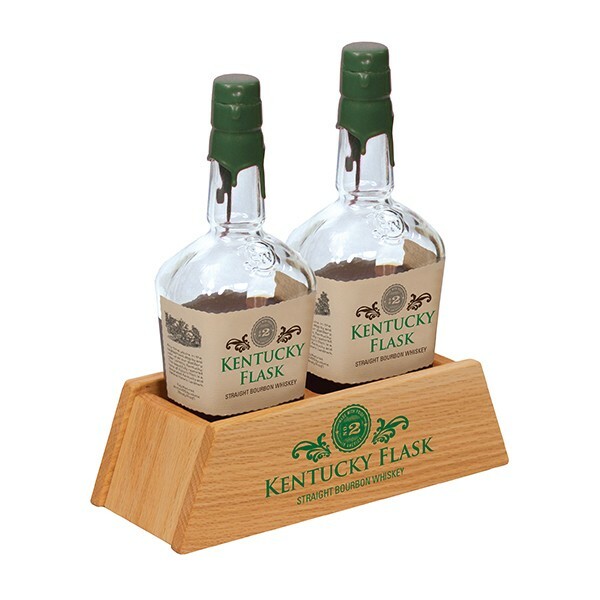 Highlight liquor on bar backs and retail displays with the beautiful solid oak Bottle Glorifier. 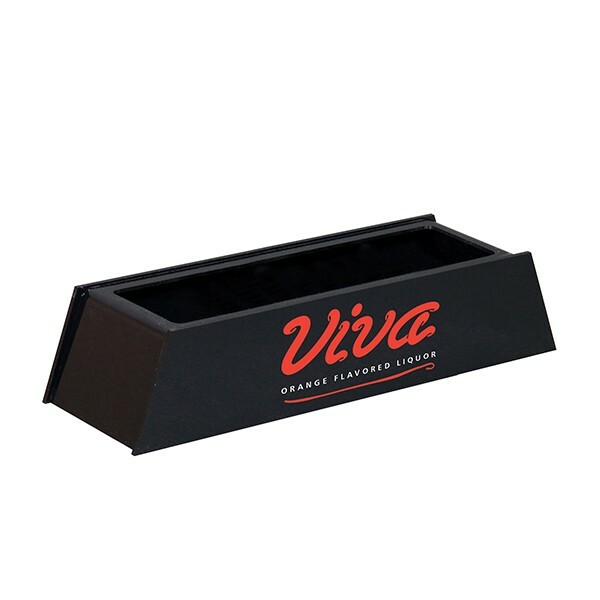 Raise your product above the rest on the shelf with this eye-catching display! • Oak construction available in 6 finishes • Customize your display with crisp, high definition imprinting! 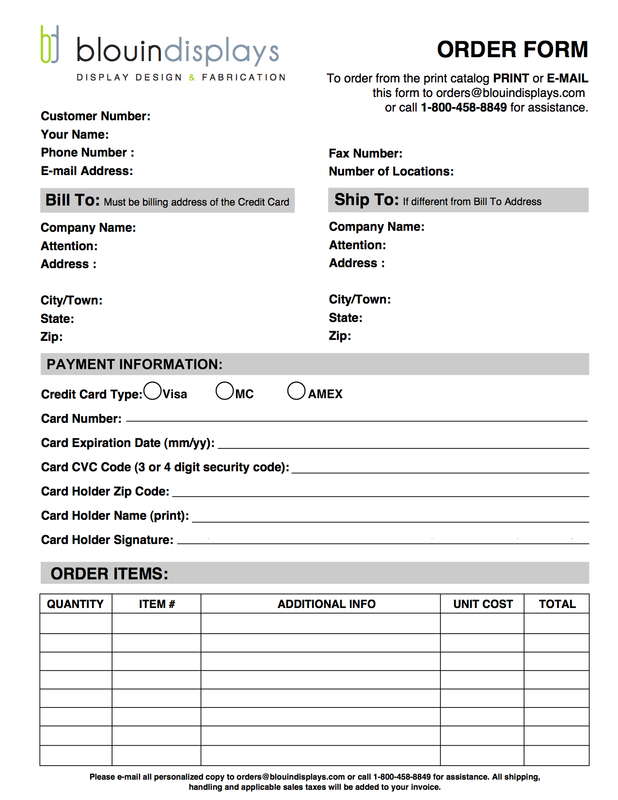 • Can be customized to fit your needs. Custom glorifiers available - call today! 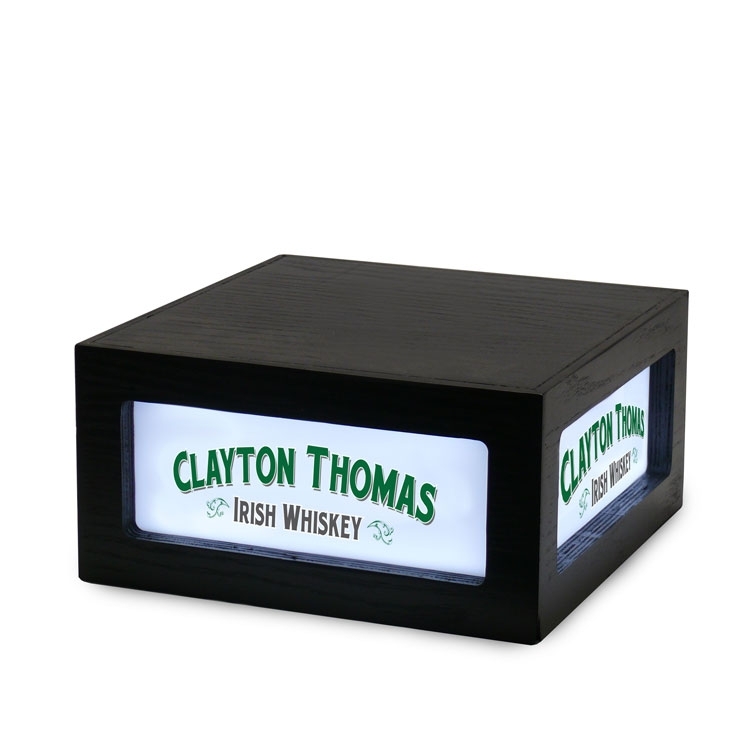 Highlight liquor on bar backs and retail displays with the beautiful solid oak Bottle Glorifier. Raise your product above the rest on the shelf with this eye-catching display! • Oak construction available in 6 finishes • Customize your display with crisp, high definition imprinting! • Also available in sizes for two or three 750ml bottles. Custom glorifiers available - call today! Highlights liquor on bar backs and retail displays, beautiful solid oak construction in your choice of standard finishes. Also available in sizes for two or three 750ml bottles. Crisp, high definition imprinting available. Custom glorifiers available - call today! 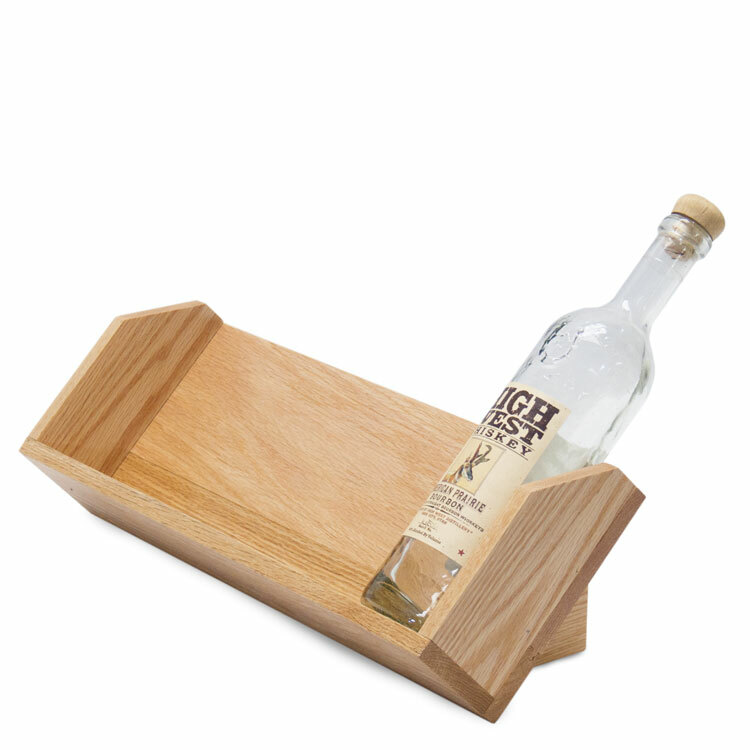 Highlights liquor on bar backs and retail displays, beautiful solid oak construction available in 5 standard finishes. 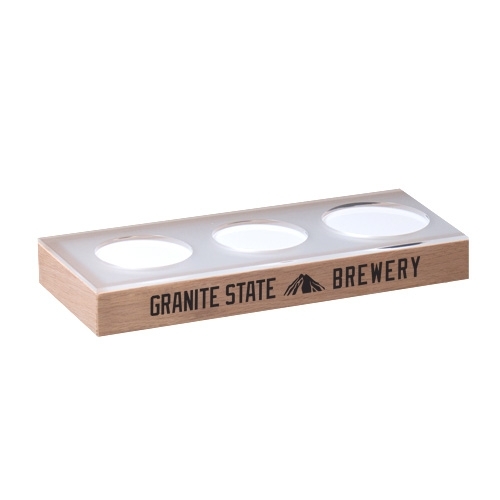 Ideal for restaurants, pubs, promotional events and tastings. 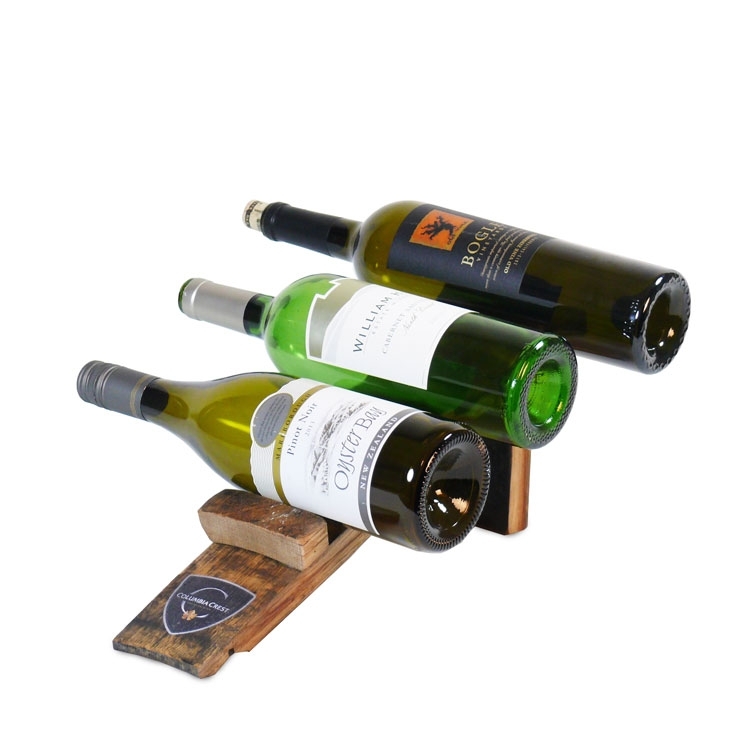 Our Stave Wine Bottle Holder is a stylish way to display a single wine bottle. 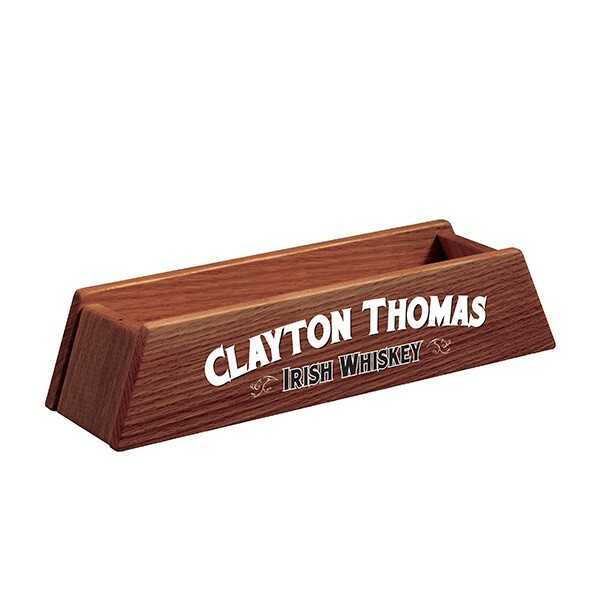 Made in USA from recycled barrel staves. 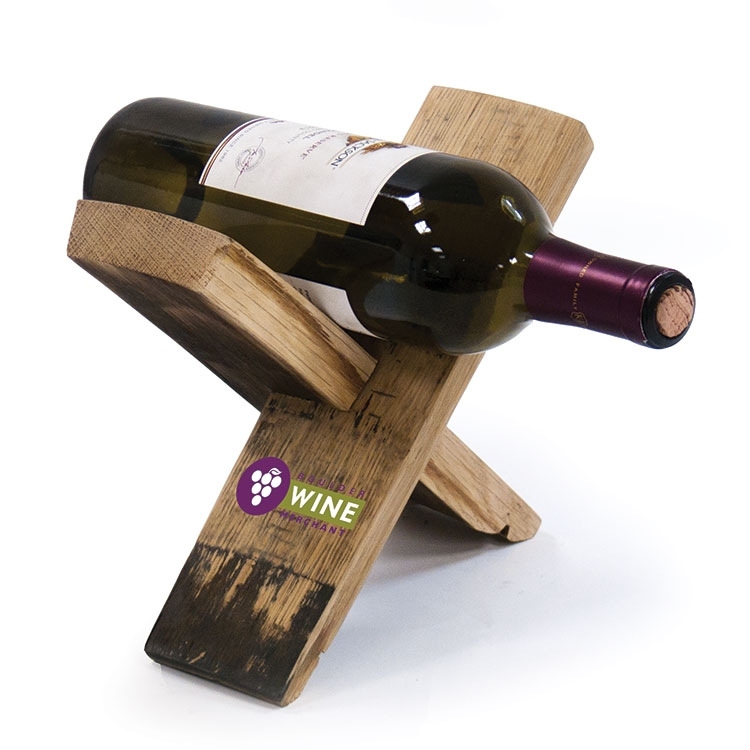 Holder is available in a natural barrel finish, naturally stained red from red wine during storage. Shown with custom laser engraved text. Call today for details on your custom options! Note: Wine bottle not included.